News of Dr Alex Ekwueme have been making the rounds by "morbid reporters" and their followers. We went through this same route in the 90s when some fella passed death sentence on the venerable Dr Nnamdi Azikiwe, who at that time was very ill but very much alive. "The whole thing had begun with a ‘letter of condolence’ that Dr Kingsley Mbadiwe had sent with accustomed magniloquence to the Federal Government on the ‘passing’ of Zik. For good measure, he also sent a copy to the NTA. That letter, plus a statement issued on behalf of the ‘National Committee for the Transition of Dr Azikiwe’ by four prominent Nigerians, was all the NTA had relied on for its categorical pronouncement on so weighty a matter. "Out-of-work politicians saw an opening and moved in swiftly. A First Republic legislator and former stalwart of the Zikist Movement, Chief RBK Okafor, panting as if he had sprinted all the way from Nsukka to Rutam House (headquarters of The Guardian newspapers) in Lagos, narrated breathlessly how he had cradled his ‘beloved Zik’ in his arms and how, even as his life ebbed, the great nationalist had said to him: ‘Chief RBK Okafor, my political son, remember that I am a Pan-Africanist and should be given a Pan-African burial,’ or words to that effect. "When the tale appeared in cold print, Okafor denied it vehemently. He forgot that Ebube Wadibia, The Guardian’s resourceful and street-smart news editor, had caught him on audiotape word for word. It turned out that Okafor had not seen Zik in several years." Here is the message for those who forgot history and are dishing falsehood about Dr Ekwueme: Virtually all of those who constituted themselves into a funeral committee while the great Zik was yet to die passed on before him. Whether old or young, we all have our appointed time determined only by the Creator. 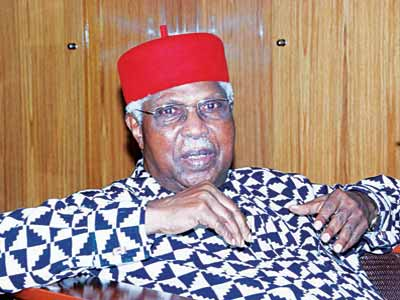 May God grant Dr Ekwueme recovery.